The trio, singer and guitarist Matt Bellamy, bass player Chris Wolstenholme and drummer Dominic Howard, have given £15,000 to buy state-of-the-art equipment for undergraduates at Plymouth University in their home county of Devon. The modular analogue synthesiser, two liquid channel pre-amps and a set of specialist orchestral and instrumental microphones will be used by the university's School of Humanities and Performing Arts. Professor David Coslett, dean of the Faculty of Arts, said: "This is a wonderfully generous gesture from Muse and will provide exciting opportunities for our students to experience the kind of industry-standard equipment very few universities have access to." The equipment will enable students to gain hands-on experience and develop the types of recording skills used in the production of television, film, live performances and video games. 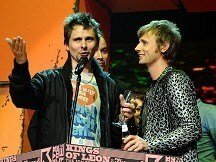 Muse, who met at school in Teignmouth, Devon, were made honorary doctors of arts by the university in 2008. They have also agreed that a portion of the donation should fund student prizes over the course of the next three years. A spokesman for the band said: "We're delighted to provide this equipment and hope it will inspire students to go on and create great music for years to come."